The new chief of the ruling Democratic Party will hold a meeting with senior officials from the presidential office and the government this week, mainly to discuss the economy, party officials said Tuesday. 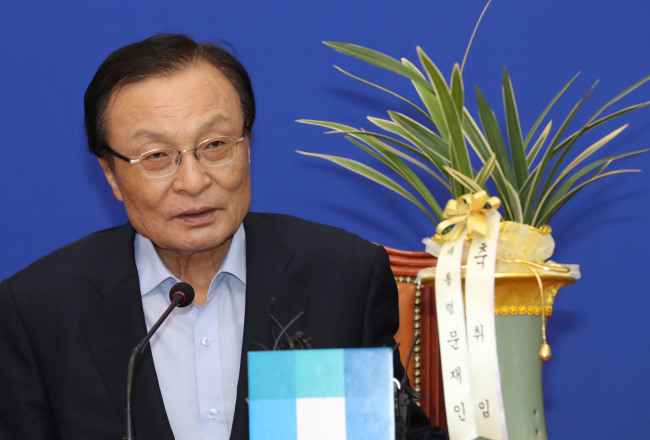 The three-way consultative meeting will be held Thursday, the first such gathering since Lee Hae-chan, a staunch liberal and former prime minister, was elected chairman of the DP last Saturday. The meeting is expected to touch upon the Moon Jae-in government's signature economic policy of "income-driven growth," which opposition parties fiercely blame for sluggish job growth. "Agenda items have not been fixed, but there are many pending issues on employment and income, and the Korean Peninsula issue in which Lee is interested could be included," a DP official said. Lee has vowed to make the DP a strong ruling party and support the Moon administration now in its second year in office.